If your family is fortunate enough to be able to take a vacation next year, consider the time-frame for the New York State Assessments in ELA and Math for grades 3-8. First of all, this is a stretch of time when the least amount of true learning is happening in classrooms across New York. The inappropriate length of the exams, combined with the set up and collection times, basically ruins half of our children's school days for each of the exam dates. Basically very little academic progress will be made over the state assessment time period. 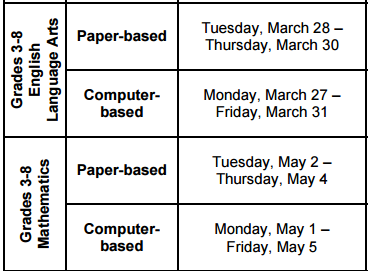 The NYS Assessments are split this year with ELA in late March and math in early May. While the March testing period is during a popular spring break period for schools and colleges around the nation, the math assessments will be given after the traditional Spring Break holidays. Amazing vacation deals are available in early May since most schools are back in session for the rest of the school year. You can save money, have a great vacation without the crowds, and protest by opting out of the harmful state exams at the same time. A win-win for your family and public education! Of course the Florida Theme Parks are a popular family trip that would be much cheaper, but how about Washington, D.C. or the National Parks that would be packed during school holidays or summer? D.C. or the National Parks could provide a great REAL learning opportunity as opposed to being locked down in a classroom with a number two pencil.